On behalf of Irrational Games, we're delighted to share the news that the first DLC for BioShock Infinite is released starting from today, along with information about future packs and assets to go with it! Download the trailer for BioShock Infinite: Clash in the Clouds from here; and the teaser for BioShock Infinite: Burial at Sea right here. Alternatively, you can grab embed codes for the videos from the Renegade PR YouTube channel here (Clash in the Clouds) or here (Burial at Sea). There are plenty of support assets including screenshots, logos, key art, titles and descriptions, staff shots from here. UK media, specialist or mainstream, please contact Tim, Tom or Lina at Renegade PR if you need assistance. New York, NY – July 30, 2013 – 2K and Irrational Games announced today that BioShock Infinite: Clash in the Clouds*, the first downloadable content pack for the best-selling multiplatform video game of 2013 to date**, BioShock Infinite, is available for download worldwide starting today on the PlayStation®3 computer entertainment system, Xbox 360® games and entertainment system from Microsoft and Windows® PC. 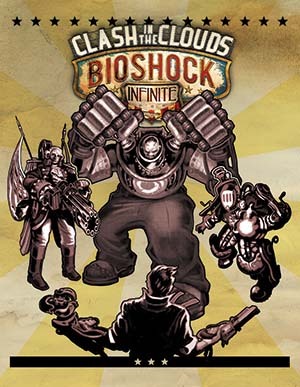 BioShock Infinite: Clash in the Clouds, developed by Irrational Games, is an action-focused downloadable content pack that presents players with a series of unique, intense challenges and a whole new gambit of combat opportunities. Players will combine a diverse toolset of weapons, Vigors, gear, Tears and Sky-Lines in four new areas inspired by the classic BioShock Infinite environments. In addition, by completing all 60 Blue Ribbon challenges, players will unlock exclusives in the Columbian Archeological Society, gaining access to new Voxophones, Kinetoscopes, concept art and more. BioShock Infinite: Clash in the Clouds is available starting today for £3.69 (400 Microsoft Points on Xbox Live® for Xbox 360) via online marketplaces on all available platforms, and is included in the BioShock Infinite Season Pass*. 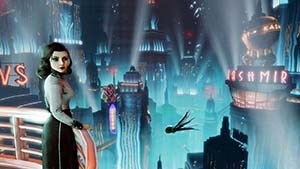 Also in development at Irrational Games, BioShock Infinite: Burial at Sea* is a two-part add-on campaign featuring an all-new story for Booker and Elizabeth, set in the underwater city of Rapture before its fall. These two campaigns will be available individually for £9.99 (1200 Microsoft Points), and are also included as part of the BioShock Infinite Season Pass. The BioShock Infinite Season Pass is available now for £15.99 (1600 Microsoft Points) and includes all three pieces of add-on content, as well as the Early Bird Special Pack, which includes powerful weapon upgrades, exclusive gold weapon skins and infusion bottles to upgrade abilities. BioShock Infinite is rated M for Mature by the ESRB. For the latest news and information on BioShock Infinite, become a fan on Facebook and follow Irrational Games on Twitter. From the creators of the highest-rated first-person shooter of all time**, BioShock, and the best-selling multiplatform video game of 2013 to date**, BioShock Infinite puts players in the shoes of U.S. Cavalry veteran turned hired gun, Booker DeWitt. Indebted to the wrong people and with his life on the line, DeWitt has only one opportunity to wipe his slate clean. He must rescue Elizabeth, a mysterious girl imprisoned since childhood and locked up in the flying city of Columbia. Forced to trust one another, Booker and Elizabeth form a powerful bond during their daring escape. Together, they learn to harness an expanding arsenal of weapons and abilities, as they fight on zeppelins in the clouds, along high-speed Sky-Lines, and down in the streets of Columbia, all while surviving the threats of the air-city and uncovering its dark secret. BioShock Infinite was released on March 26, 2013 for Xbox 360, PS3 and PC. For more information on BioShock Infinite, please visit http://www.bioshockinfinite.com. **Based on The NPD Group estimates of U.S. retail video game sales through June 2013 for combined sales of BioShock Infinite on Xbox 360, PS3 and PC. ***According to 2008 - 2013 Metacritic.com and The NPD Group estimates of U.S. retail video game sales through June 2013. Located near Boston, Massachusetts, Irrational Games is widely recognized as one of the industry's leading game developers. Irrational has earned a reputation for creating story-driven, genre-defining games with award-winning hits like System Shock 2, Freedom Force, and the original BioShock. For more information, visit http://www.irrationalgames.com. The statements contained herein which are not historical facts are considered forward-looking statements under federal securities laws and may be identified by words such as "anticipates," "believes," "estimates," "expects," "intends," "plans," "potential," "predicts," "projects," "seeks," "will," or words of similar meaning and include, but are not limited to, statements regarding the outlook for the Company's future business and financial performance. Such forward-looking statements are based on the current beliefs of our management as well as assumptions made by and information currently available to them, which are subject to inherent uncertainties, risks and changes in circumstances that are difficult to predict. Actual outcomes and results may vary materially from these forward-looking statements based on a variety of risks and uncertainties including: our dependence on key management and product development personnel, our dependence on our Grand Theft Auto products and our ability to develop other hit titles for current and next-generation platforms, the timely release and significant market acceptance of our games, the ability to maintain acceptable pricing levels on our games, our ability to raise capital if needed and risks associated with international operations. Other important factors and information are contained in the Company's Annual Report on Form 10-K for the fiscal year ended March 31, 2013, in the section entitled "Risk Factors," the Company’s Registration Statement on Form S-3 filed with the SEC on June 12, 2013, and the Company's other periodic filings with the SEC, which can be accessed at www.take2games.com. All forward-looking statements are qualified by these cautionary statements and apply only as of the date they are made. The Company undertakes no obligation to update any forward-looking statement, whether as a result of new information, future events or otherwise.